Note: Nuclear capacity in outage is estimated based on monthly generation data collected by EIA and daily availability data from the Nuclear Regulatory Commission. Nuclear outages in 2012 were generally higher than in recent years because of extended forced and planned outages at four nuclear power plants, and they continued into the new year. 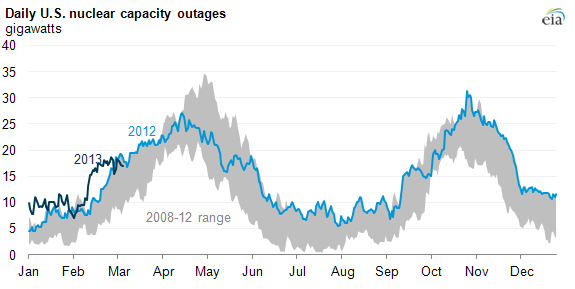 Coupled with the beginning of spring refueling outages, outage levels in early 2013 are above those seen in the previous five years. Southern California Edison's San Onofre Nuclear Generating Station (SONGS) Units 2 and 3 (2,150 MW total) near San Diego, California, have both been offline since January 2012 as a precaution after a steam generator tube leak led to the discovery of excessive wear in the plant's new steam generators. The units remain offline while the problems are evaluated and repairs are made, which tightened electricity supply for Southern California last summer. Omaha Public Power District's (OPPD) Fort Calhoun reactor (478 MW) has been offline since April 9, 2011, initially due to flooding on the Missouri River. A subsequent inspection by the U.S. Nuclear Regulatory Commission identified additional problems, and OPPD is working through a checklist of repairs and changes to be addressed before restarting the plant. In August, OPPD hired Exelon, a company that operates 17 U.S. nuclear plants, to manage Fort Calhoun. Progress Energy Florida's Crystal River Unit 3 (860 MW) about 60 miles southwest of Gainesville, Florida, has been offline since September 2009 to repair the reactor containment vessel. Progress's handling of Crystal River repairs became an issue in the company's recent merger with Duke Energy. In February, Duke Energy announced plans to retire this unit from service. At NextEra Energy's Turkey Point plant outside Miami, Florida, Unit 3 (802 MW) went offline in late February 2012 for refueling, underwent additional repairs through the summer and early fall, and only returned to service in late October. In early November, Turkey Point Unit 4 (693 MW) was taken offline for a planned four-month refueling and maintenance outage.